Make, bake and cool cake as directed on box for 13x9-inch pan. Poke cake every 1/2 inch with handle of wooden spoon. In medium bowl, beat pudding mix and milk with whisk about 2 minutes. Pour pudding evenly over cake. Run knife around sides of pan to loosen cake. Refrigerate about 2 hours or until chilled. Store loosely covered in refrigerator. To make this cake more special, top with whipped cream and chopped toasted nuts or a scoop of fudge swirl ice cream. 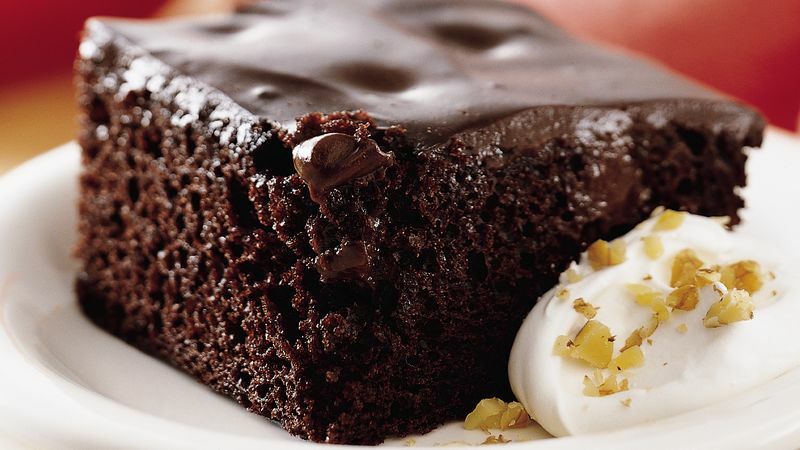 You can use chocolate fudge instead of chocolate pudding. If you’ve got a box of Betty Crocker™ Super Moist™ chocolate fudge cake mix in your pantry, you’re not far from serving up a totally decadent take on chocolate cake. What makes this cake special is the poke method. Just grab a wooden spoon and poke the surface of the cake; this allows the silky filling of milk and chocolate pudding to permeate the cake, giving it a delectable ooey-gooey texture. With this simple yet special approach, you can serve up a cake that no one would ever guess is made from a mix. In fact, it’s a perfect potluck dessert that travels well — inside your trusty 13x9-baking dish — and serves 12 people. If you want to gussy it up, you can always add whipped cream and chopped nuts! Want to learn more new ways to make the perfect cake? Betty’s got you covered!